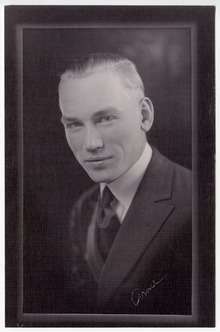 Arnold Orville Beckman (April 10, 1900 – May 18, 2004) was an American chemist, inventor, investor, and philanthropist. While a professor at California Institute of Technology, he founded Beckman Instruments based on his 1934 invention of the pH meter, a device for measuring acidity, later considered to have "revolutionized the study of chemistry and biology". He also developed the DU spectrophotometer, "probably the most important instrument ever developed towards the advancement of bioscience". Beckman funded the first transistor company, thus giving rise to Silicon Valley. After retirement, he and his wife Mabel (1900-1989) were numbered among the top philanthropists in the United States. Fourteen Weeks in Chemistry, page 27. Arnold Orville Beckman was born in Cullom, Illinois, a village of about 500 people in a farming community. He was the youngest son of George Beckman, a blacksmith, and his second wife Elizabeth Ellen Jewkes. :5 He was curious about the world from an early age. When he was nine, Beckman found an old chemistry textbook, Joel Dorman Steele's Fourteen Weeks in Chemistry, and began trying out the experiments. :9 His father encouraged his scientific interests by letting him convert a toolshed into a laboratory. When Beckman turned 18 in August 1918, he enlisted in the United States Marines. After three months at marine boot camp on Parris Island, South Carolina,:31 he was sent to the Brooklyn Navy Yard, for transit to the war in Europe. Because of a train delay, another unit embarked in place of Beckman's unit. Then, counted into groups in the barracks, Beckman missed being sent to Russia by one space in line. :32 Instead, Arnold spent Thanksgiving at the local YMCA, where he met 17-year-old Mabel Stone Meinzer, who was helping to serve the meal. Mabel would become his wife. :33 A few days later, the armistice was signed, ending the war. Soon after arriving at the University of Illinois, Beckman joined the Delta Upsilon Fraternity. :55 He was initiated into Zeta Chapter of Alpha Chi Sigma, the chemistry fraternity, in 1921 and the Gamma Alpha Graduate Scientific Fraternity in December 1922. Beckman decided to go to California Institute of Technology (Caltech) for his doctorate. He stayed there for a year, before returning to New York to be near his fiancée, Mabel, who was working as a secretary for the Equitable Life Assurance Society. He found a job with Western Electric's engineering department, the precursor to the Bell Telephone Laboratories. Working with Walter A. Shewhart,:61 Beckman developed quality control programs for the manufacture of vacuum tubes and learned about circuit design. It was here that Beckman discovered his interest in electronics. In 1933, Beckman and his family built a home in Altadena, California, in the foothills and adjacent to Pasadena. They lived in Altadena for over twenty seven years, raising their family. During his time at Caltech, Beckman was active in teaching at both the introductory and advanced graduate levels. Beckman shared his expertise in glass-blowing by teaching classes in the machine shop. He also taught classes in the design and use of research instruments. 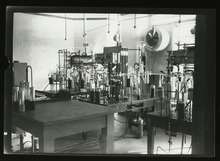 Beckman dealt first-hand with the chemists' need for good instrumentation as manager of the chemistry department's instrument shop. :96–99 Beckman's interest in electronics made him very popular within the chemistry department at Caltech, as he was very skilled in building measuring instruments. Over the time that he was at Caltech, the focus of the department increasingly moved towards pure science and away from chemical engineering and applied chemistry. Arthur Amos Noyes, head of the chemistry division, encouraged both Beckman and chemical engineer William Lacey to be in contact with real-world engineers and chemists, and Robert Andrews Millikan, Caltech's president, referred technical questions to Beckman from government and businesses. :98–101 With their blessing, Beckman began accepting outside work as a scientific and technical consultant. He also acted as a scientific expert in legal trials. In 1934, Millikan referred I. H. Lyons from the National Postal Meter Company to Arnold Beckman. Lyons wanted a non-clogging ink so that postage could be printed by machines, instead of having clerks lick stamps. Beckman's solution was to make ink with butyric acid, a malodorous substance. Because of this ingredient, no manufacturer wanted to manufacture it. Beckman decided to make it himself. He started the National Inking Appliance Company, obtaining space in a garage owned by instrument maker Fred Henson and hiring two Caltech students, Robert Barton and Henry Fracker. Beckman developed and took out a couple of patents for re-inking typewriter ribbons, but marketing them was not successful. This was Beckman's first experience at running a company and marketing a product, and while this first product failed, Beckman repurposed the company for another product. Beckman saw an opportunity, and rethinking the project, decided to create a complete chemical instrument which could be easily transported and used by nonspecialists. 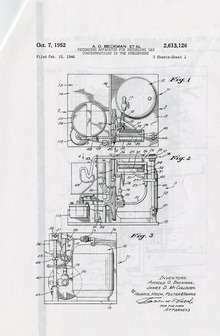 By October 1934, he had registered patent application U.S. Patent No. 2,058,761 for his "acidimeter", later renamed the pH meter. :131 The Arthur H. Thomas Company, a nationally known scientific instrument dealer based in Philadelphia, was willing to try selling it. Although it was priced expensively at $195, roughly the starting monthly wage for a chemistry professor at that time, it was significantly cheaper than the estimated cost of building a comparable instrument from individual components, about $500. :134–135 The original pH meter weighed in at nearly 7 kg, but was a substantial improvement over a benchful of delicate equipment. The earliest meter had a design glitch, in that the pH readings changed with the depth of immersion of the electrodes, but Beckman fixed the problem by sealing the glass bulb of the electrode. Beckman's DU spectrophotometer has been referred to as the "Model T" of scientific instruments: "This device forever simplified and streamlined chemical analysis, by allowing researchers to perform a 99.9% accurate quantitative measurement of a substance within minutes, as opposed to the weeks required previously for results of only 25% accuracy." Theodore L. Brown notes that it "revolutionized the measurement of light signals from samples". :2 Nobel laureate Bruce Merrifield is quoted as calling the DU spectrophotometer "probably the most important instrument ever developed towards the advancement of bioscience." Development of the spectrophotometer also had direct relevance to the war effort. For example, the role of vitamins in health was being studied, and scientists wanted to identify Vitamin A-rich foods to keep soldiers healthy. Previous methods involved feeding rats for several weeks, then performing a biopsy to estimate Vitamin A levels. The DU spectrophotometer yielded better results in a matter of minutes. The DU spectrophotometer was also an important tool for scientists studying and producing the new wonder drug penicillin. 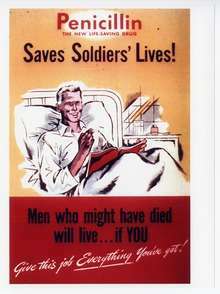 By the end of the war, American pharmaceutical companies were producing 650 billion units of penicillin each month. Much of the work done in this area during World War II was kept secret until after the war. Beckman and his company were involved in a number of secret projects. There was a critical shortage of rubber, which was used in jeep and airplane tires and in tanks. Natural sources from the Far East were unavailable because of the war, and scientists sought a reliable synthetic substitute. Beckman was approached by the Office of Rubber Reserve about developing an infrared spectrophotometer to aid in the study of chemicals such as toluene and butadiene. The Office of Rubber Reserve met secretly in Detroit with Robert Brattain of the Shell Development Company, Arnold O. Beckman, and R. Bowling Barnes of American Cyanamid. Beckman was asked to secretly produce a hundred infrared spectrophotometers to be used by authorized government scientists, based on a design for a single-beam spectrophotometer which had already been developed by Robert Brattain for Shell. :163 The result was the Beckman IR-1 Spectrophotometer. By September 1942, the first of the instruments was being shipped. Approximately 75 IR-1s were made between 1942 and 1945 for use by the U.S. synthetic-rubber effort. The researchers were not allowed to publish or discuss anything related to the new machines until after the war. Other researchers who were independently pursuing the development of infrared spectrometry, were able to publish and to develop instruments during this time without being affected by secrecy restrictions. At the same time that Beckman was approached about infrared spectrometry, he was contacted by Paul Rosenberg. Rosenberg worked at MIT's Radiation Laboratory. The lab was part of a secret network of research institutions in both the United States and Britain that were working to develop radar, "radio detecting and ranging". The project was interested in Beckman because of the high quality of the tuning knobs or "potentiometers" which were used on his pH meters. Beckman had trademarked the design of the pH meter knobs, under the name "helipot" for "helical potentiometer". Rosenberg had found that the helipot was more precise, by a factor of ten, than other knobs. Nonetheless, for use in continuously moving airplanes, ships, or submarines, which might be under attack, a redesign would be needed to ensure that the knobs could withstand shocks and vibrations. Linus Pauling at Caltech was also doing secret work for the military. The National Defense Research Committee called a meeting on October 3, 1940, wanting an instrument that could reliably measure oxygen content in a mixture of gases, so that they could measure oxygen conditions in submarines and airplanes. Pauling designed the Pauling oxygen meter for them. Originally approached to supply housing boxes for the meter by Holmes Sturdivant, Pauling's assistant, Beckman was soon asked to produce the entire instrument. In postwar Southern California, including the area of Pasadena where the Beckmans lived, smog was becoming an increasing topic of conversation, as well as an unpleasant experience. First characterized as "gas attacks" in 1943, suspicion fell on a variety of possible causes including the smudge pots used by orange growers, the smoke produced by local industrial plants, and car exhausts. The Los Angeles Chamber of Commerce was one of the organizations concerned about the possible causes and effects of smog, as it related both to industry (and jobs) and to quality of life in the area. Beckman was involved with the Chamber of Commerce. In 1947, California governor Earl Warren signed a statewide air pollution control act, authorizing the creation of Air Pollution Control Districts (APCDs) in every county of the state. The Los Angeles Chamber of Commerce asked Beckman to represent them in dealing with creation of a local APCD. The new APCD, when formed, asked Beckman to become the scientific consultant to the Air Pollution Control Officer. He held the position from 1948 to 1952. The Air Pollution Control Officer in question was Louis McCabe, a geologist with a background in chemical engineering. McCabe initially suspected that smog was a result of sulfur dioxide pollution, and proposed that the county convert the suspected pollutant into fertilizer through a costly process. Beckman was not convinced that sulfur dioxide was the real culprit behind Los Angeles smog. He visited Gary, Indiana, where steps were being taken to address sulfur dioxide pollution, and was struck by the characteristic smell of sulfur in the air. Returning, Beckman convinced McCabe that they needed to search for a different cause. Patent 1071952, "Apparatus for recording gas concentrations in the atmosphere"
Beckman Instruments also acquired the Liston-Becker Instrument Company in June 1955. Founded by Max D. Liston, Liston-Becker had a successful record in the development of infrared gas analyzers. :207–208 Liston developed instruments to measure smog and car exhaust emissions, essential to attempts to improve Los Angeles air quality in the 1950s. In 1954, Beckman Instruments acquired ultracentrifuge maker Spinco (Specialized Instruments Corp.), founded by Edward Greydon Pickels in 1946. This acquisition was the basis of Beckman's Spinco centrifuge division. 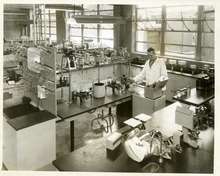 The division went on to design and manufacture a range of preparative and analytical ultracentrifuges. Because Shockley's aging mother lived in Palo Alto, Shockley wanted to establish the laboratory in nearby Mountain View, California. Frederick Terman, provost at Stanford University, offered the firm space in Stanford's new industrial park. The firm launched in February 1956, the same year that Shockley received the Nobel Prize in Physics along with John Bardeen and Walter Houser Brattain "for their researches on semiconductors and their discovery of the transistor effect". Shockley Semiconductor Laboratory was the first establishment working on silicon semiconductor devices in what came to be known as Silicon Valley. The 1960s were a time of change for the Beckmans. Mabel fell in love with a house by the sea in Corona del Mar near Newport Beach, California. They bought the house in 1960, renovated it, and lived there together until Mabel's death in 1989. The Beckmans' first major philanthropic gift went to Caltech. In supporting Caltech, they expanded on the long-term relationship that Beckman had begun as a student at Caltech, and continued as a teacher and trustee. In 1962, they funded the construction of a concert hall, the Beckman Auditorium, designed by architect Edward Durrell Stone. 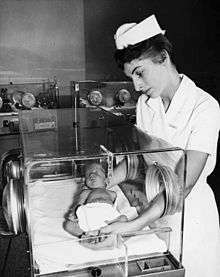 :289–290 Over a period of years, they also supported the Beckman Institute, Beckman Auditorium, Beckman Laboratory of Behavioral Sciences, and Beckman Laboratory of Chemical Synthesis at the California Institute of Technology. In the words of Caltech's president emeritus David Baltimore, Beckman "has shaped the destiny of Caltech." The Beckmans are also named in the The Beckman Institute and the Beckman Quadrangle at the University of Illinois at Urbana-Champaign. The Arnold and Mabel Beckman Foundation was incorporated in September 1977.:317 At the time of Beckman's death, the Foundation had given more than 400 million dollars to a variety of charities and organizations. In 1990, it was considered one of the top ten foundations in California, based on annual gifts. Donations chiefly went to scientists and scientific causes as well as Beckman's alma maters. He is quoted as saying, "I accumulated my wealth by selling instruments to scientists,... so I thought it would be appropriate to make contributions to science, and that's been my number one guideline for charity." Beckman Research Institute (BRI) at the City of Hope National Medical Center in Duarte, California, United States. After Mabel's death in 1989, Arnold Beckman reorganized the foundation to continue in perpetuity, and developed new initiatives for the foundation's giving. A major focus became the improvement of science education. Beginning in 1998 the Foundation has provided over $23 million to support K-6 hands-on, research-based science education to school districts in Orange County, California, stimulating schools to integrate science into the K-6 curriculum as a core subject. As of 2009, 30,000 K-6 teachers had received training and professional development in hands-on research-based science instruction, directly impacting the science instruction of 1.2 million students. Arnold Beckman envisioned the Beckman Scholars and Beckman Young Investigators programs to support young scientists at the university level. Each year, the Beckman Foundation selects a list of universities and colleges, each of which selects student from its institution for the Beckman Scholars Program. The Beckman Young Investigators Program provides research support to promising faculty members in the early stages of academic careers in the chemical and life sciences, particularly those whose work involves methods, instruments and materials that may open up new avenues of research in science. The Arnold and Mabel Beckman Foundation also supports vision research through its Beckman Initiative in Macular Research and the Beckman-Argyros Award in Vision Research. Supported activities include research into laser surgery and macular degeneration. Arnold Beckman died May 18, 2004, at the age of 104, in hospital in La Jolla, Calif. Mabel and Arnold Beckman are buried beneath a simple headstone in West Lawn Cemetery in Cullom, Illinois, the small town where he was born. Arnold Beckman was elected a Fellow of the American Academy of Arts and Sciences in 1976. Beckman was inducted into the Junior Achievement U.S. Business Hall of Fame in 1985. In 1987, he was inducted into the National Inventors Hall of Fame in Akron, Ohio. In 2004 he received its Lifetime Achievement Award. He was inducted into the Alpha Chi Sigma Hall of Fame in 1996. In 2000, he received a Special Millennium Edition of the Othmer Gold Medal from the Chemical Heritage Foundation in recognition of his multifaceted contributions to chemical and scientific heritage. Beckman was awarded the National Medal of Technology in 1988. It is the highest honor the United States can confer to a US citizen for achievements related to technological progress President George H. W. Bush presented Beckman with the National Medal of Science Award in 1989, "for his leadership in the development of analytical instrumentation and for his deep and abiding concern for the vitality of the nation's scientific enterprise.". He had previously been recognized by the Reagan administration as one of about 30 citizens receiving the 1989 Presidential Citizens Medal for exemplary deeds of service. Beckman was awarded the Public Welfare Medal from the National Academy of Sciences in 1999. The Arnold O. Beckman High School in Irvine, California which has a focus in science education, was named in honor of Arnold O. Beckman. It was not, however, funded by Beckman. The Beckman Coulter Heritage exhibit, which discusses the work of scientists Arnold Beckman and Wallace Coulter, is located at the Beckman Coulter headquarters in Brea, California. 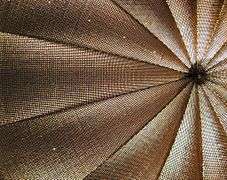 ↑ Gallwas, Jerry (2004). "People: Arnold Orville Beckman (1900–2004)". Analytical Chemistry. 76 (15): 264 A. doi:10.1021/ac041608j. 1 2 Simoni, Robert D.; Hill, Robert L.; Vaughan, Martha; Tabor, Herbert (December 5, 2003). 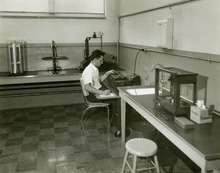 "A Classic Instrument: The Beckman DU Spectrophotometer and Its Inventor, Arnold O. Beckman". The Journal of Biological Chemistry. 278. Retrieved 6 March 2014. 1 2 3 4 5 6 7 8 9 10 11 12 13 14 15 16 17 18 19 20 21 22 23 24 25 26 27 28 29 30 31 32 33 34 35 36 37 38 39 40 41 42 43 44 45 46 47 48 49 50 51 52 53 54 55 56 57 58 59 60 61 62 63 64 65 66 67 68 Arnold Thackray & Minor Myers, Jr. (2000). Arnold O. Beckman : one hundred years of excellence. foreword by James D. Watson. Philadelphia, Pa.: Chemical Heritage Foundation. ISBN 978-0-941901-23-9. ↑ "Chapman Remembers Dr. Arnold O. Beckman". Chapman University. May 5, 2005. Retrieved 13 Sep 2016. 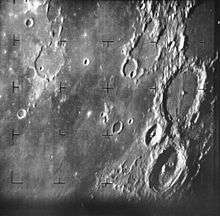 1 2 Sturchio, Jeffrey; Thackray, Arnold (23 April 1985). "Interview with Arnold O. Beckman". Center for Oral History. Chemical Heritage Foundation. Retrieved 8 March 2014. 1 2 "Alpha Chi Sigma Hall of Fame". Alpha Chi Sigma Fraternity. Retrieved 4 March 2014. ↑ Jaehnig, Kenton G. "Finding Aid to the Beckman Historical Collection 1911 - 2011 (Bulk 1935 - 2004 )". Chemical Heritage Foundation. Chemical Heritage Foundation Archives. Retrieved 30 October 2015. Click on 'Beckman Historical Collection Finding Aid' to go to full document. 1 2 Luther, Claudia (May 19, 2004). "Arnold O. Beckman, 104". Chicago Tribune News. Retrieved 8 March 2014. ↑ "Beckman DU Spectrophotometer". National Museum of American History. Retrieved 6 March 2014. ↑ "Arnold O. Beckman". Massachusetts Institute of Technology. Retrieved 6 March 2014. 1 2 Brown, Theodore L. (2009). Bridging divides : the origins of the Beckman Institute at Illinois. Urbana: University of Illinois. ISBN 978-0252034848. Retrieved 11 December 2014. ↑ Mark, Andrew (September 21, 2007). "Leading the way in chemical instrumentation". Laboratory News. Retrieved 6 March 2014. ↑ Smutzer, Gregory (October 15, 2001). "Spectrophotometers: An Absorbing Tale". The Scientist. Retrieved 6 March 2014. ↑ Markel, Howard. "The Real Story Behind Penicillin". September 27, 2013. PBS Newshour. Retrieved 6 March 2014. ↑ Sneader, Walter (2005). Drug Discovery: A History. Chichester: John Wiley. p. 294. ISBN 9780470359297. ↑ "Beckman Infrared Spectrometer". Chemical Heritage Foundation. Retrieved 24 June 2013. ↑ "Liston-Becker Model 28 Exhaust Gas Analyzer". Chemical Heritage Foundation. Retrieved 23 June 2015. 1 2 Brock, David C. (29 Nov 2013). "How William Shockley's Robot Dream Helped Launch Silicon Valley". IEEE Spectrum. Retrieved 10 April 2014. ↑ "The Nobel Prize in Physics 1956". Nobel Foundation. Retrieved 2008-10-09. ↑ "Beekman Instruments Data Systems". Wall Street Journal. 9 July 1957. p. 12. ↑ Berkman, Leslie (June 3, 1989). "Mabel Beckman, Noted Philanthropist, Dies at 88". Los Angeles Times. Retrieved 7 March 2014. ↑ Pasco, Jean O. (June 12, 2004). "Beckman Remembered as 'Larger Than Life'". Los Angeles Times. Retrieved 8 March 2014. ↑ "California's Top Foundations". Los Angeles Times. July 1, 1990. Retrieved 7 March 2014. ↑ "Arnold Beckman, Ph.D: Philanthropy". Arnold and Mabel Beckman Foundation. Retrieved 7 March 2014. 1 2 3 Gochman, N. (2004). "Arnold O. Beckman, PhD (1900–2004)" (PDF). Clinical Chemistry. 50 (8): 1486. doi:10.1373/clinchem.2004.037861. Retrieved 7 March 2014. ↑ Arakal, Byron de (1992). "The Cure". Orange Coast Magazine. August: 86–95. Retrieved 4 August 2015. ↑ Naqvi, Roya (March 21, 2006). "$20 Million Gift from Arnold and Mabel Beckman Foundation Establishes New Model for Cancer Immunotherapy". Business Wire. Retrieved 7 March 2014. ↑ Saliba, Jaimee (Oct 29, 2012). "Irvine Biomedical Engineering Nets $3M NSF Grant for Biophotonics PhD Program". Science Market Update. Retrieved 8 March 2014. ↑ "History of the Beckman Institute". Beckman Institute. Retrieved 8 March 2014. ↑ "Beckman Center History". Stanford School of Medicine. Retrieved 8 March 2014. ↑ Brown, Doug (November 20, 1987). 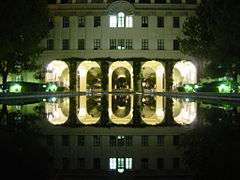 "Caltech Gets $40 Million as Beckman Pledge Is Met". Los Angeles Times. Retrieved 8 March 2014. ↑ Williams, Linda (April 11, 1988). "Pepperdine MBA Program Receives Big Beckman Gift". Los Angeles Times. Retrieved 8 March 2014. ↑ Davis Jr., Martin A. (July 2003). "Inventing New Ways to Teach Science". Philanthropy magazine. Retrieved 16 October 2014. 1 2 "Arnold and Mabel Beckman Foundation". Arnold and Mabel Beckman Foundation. 2009. Retrieved 10 April 2014. ↑ Nguyen, Tina (September 15, 1998). "Beckman's $14.4-Million Science Project". Retrieved 8 March 2014. ↑ Martelle, Scott (September 21, 1998). "Glad Scientist: Child of Einstein Age, Arnold Beckman Sows Educational Seeds for Another". Los Angeles Times. Retrieved 8 March 2014. ↑ "An Impressive Assist for Schools". Los Angeles Times. 1998-09-20. Retrieved 7 March 2014. ↑ "Science education for tomorrow's leaders". Fountain Valley Educational Foundation. Retrieved 16 October 2014. ↑ "Beckman Scholars Program". Arnold and Mabel Beckman Foundation. Retrieved 16 October 2014. ↑ "Beckman Young Investigators Program". Arnold and Mabel Beckman Foundation. Retrieved 16 October 2014. ↑ "The Arnold and Mabel Beckman Foundation Announces the Beckman-Argyros Award in Vision Research". Press Release. February 21, 2013. Retrieved 10 April 2014. ↑ Samuels, Allison (January 12, 1990). "Beckman Gives $6.2 Million to UCI Laser Clinic : Philanthropy: Gift is the largest received in the university's history. It launches a campuswide campaign to raise its endowment to $200 million.". Los Angeles Times. Retrieved 7 March 2014. ↑ "Arnold and Mabel Beckman Foundation awards UCI's Gavin Herbert Eye Institute $3 million for retinal degeneration research". UCI Irvine News. Feb 12, 2013. Retrieved 7 March 2014. ↑ Saxon, Wolfgang (May 20, 2004). 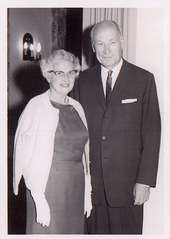 "A. O. Beckman, 104, Science Benefactor, Dies". New York Times. Retrieved 7 March 2014. ↑ Hahn, Barbara (2012-10-29). "A small town boy who found a book - Arnold Beckman". Barbara Hahn's Blog. Retrieved 8 March 2014. ↑ "The U.S. Business Hall of Fame". Fortune Magazine. April 15, 1985. ↑ "Beckman Named to Inventors Hall of Fame". Los Angeles Times. 9 February 1987. Retrieved 4 March 2014. ↑ "Othmer Gold Medal". Chemical Heritage Foundation. Retrieved 8 March 2014. ↑ "National Science and Technology Medals, 1988". National Science and Technology Medals Foundation. Retrieved 8 March 2014. ↑ "Beckman Given Science Medal by President". Los Angeles Times. October 19, 1989. Retrieved 8 March 2014. ↑ Berkman, Leslie (January 24, 1989). "Medical". Los Angeles Times. Retrieved 8 March 2014. ↑ "Public Welfare Award". National Academy of Sciences. Retrieved February 18, 2011. Sturchio, Jeffrey; Thackray, Arnold (23 April 1985). "Interview with Arnold O. Beckman". Center for Oral History. Chemical Heritage Foundation.